Prime Minister Dr. the Hon. 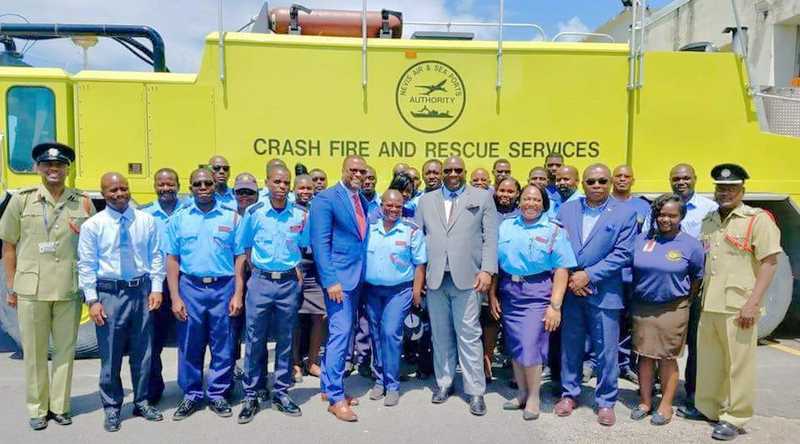 Timothy Harris, Premier of Nevis the Honourable Mark Brantley with officers of the Nevis Division of the Fire and Rescue Services in Nevis. Minister Brantley was at the time giving his support to the Police (Amendment) Bill, 2018, which was successfully passed through the Federal Parliament on Sept. 9. An amendment of Section 24 makes provisions for non-gazetted police officers with critical skills, and a desire to continue serving the public after the retirement age of 55 years, to do so with the approval of the competent authorities. “We can’t expect of the police Mr. Speaker that they will give of their best if we as a government are not prepared to support them and I am here to say that no government in the history of this country has supported the police as much as this government,” Minister Brantley added, while stating that there is evidence to support his statements. One such piece of evidence is the year-on-year record increases in the budgetary allocation for the Ministry of National Security by the Team Unity administration. Moreover, in July of this year, the Team Unity administration initiated a 40 percent increase in the displacement allowances and a 50 percent increase in the ferry allowances for law enforcement personnel who travel between the islands for work.